The Lucky Cat has been a popular decor item in American households for decades. Believed to bring good fortune, many variations are available – including ones designed to deliver money, luck, happiness and other great things. Although many refer to him as the Chinese Lucky Cat, his origin is actually Japanese. The Maneki Neko (which actually means beckoning cat) was first advertised in 1902, and theorists say he was first introduced around 1876 (there’s argument whether he comes from Osaka or Tokyo). 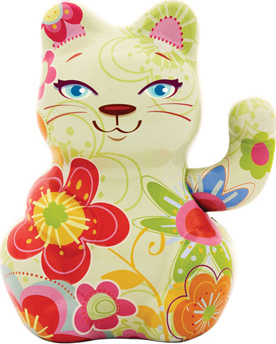 In popular culture, this good luck kitty can also be found in the form of key chains, piggy banks, ornaments or other decorative items. 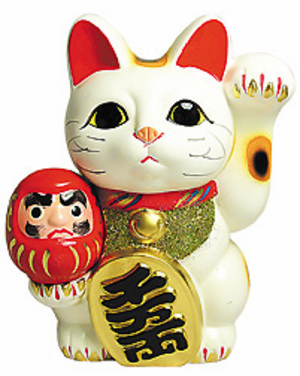 It’s the Lucky Cat statue or figurine that is most recognizable, and common materials used were either ceramic or tin. He’s been seen in many colors and levels of ornateness. Traditionally, he always beckons us with an upright left paw, and many businesses placed him at entrances to “welcome” us. Other postures, though, have been used over the years, including two paws up, and mechanical figures which depict a waving paw. Typically, the left paw raised invites people, while the right paw raised invites money. The most common colors of the cat are white, black, gold (yellow) and red, and each has meaning. White is for luck, black for good health, gold/yellow for money, and red for love. Collectors of original Maneki Nekos also look for other features, including neckwear, ornamental design, and what the cat might be holding. Each detail was designed with a purpose. Retro-style Good Luck Kitty: Serenity. Most interesting are the “legends” behind these cats. There are several, but among the most popular is that of a starving stray cat being taken in by a poor shop owner. In return, the cat sits outside, by the front door, and beckons new customers with its left paw. The cat, bringing prosperity to the shop owner, has since been a long-standing symbol of good fortune for small business owners. Other folktales center around the cat diverting people from danger. Of course, many collect lucky cats because they find them adorable. Newer, retro-styled figures don colorful designs and are displayed for fun just as much as perceived luck. Want to learn more about the Maneki Neko? Two resources include Japan Monthly Web Magazine and Wikipedia. Do you collect these figures? We’d love to see your pictures.